Supply chain is happening at your company. And even if you don’t have supply or chain (or purchasing, procurement, planning, warehousing, logistics, sourcing, customer fulfillment, operations, import, export or buyer) in your job title, your company’s supply chain impacts you — because supply chains cost your company money and time. And if you’re not paying attention to your company’s money or time, you might want to check out a to-do list. Marketing, sales, R&D, engineering, finance, quality, accounting — all of these functions should understand supply chain. What is supply chain? How does it impact my job? And what can I do to optimize my function’s relationship with supply chain? At its broadest definition, supply chain is the management of the flow of goods from the suppliers who supply your suppliers through to your customers. In the toilet paper industry, the breadth of supply chain is described like this: “from stump to rump.” I did not make that up. See how much fun we have in supply chain? 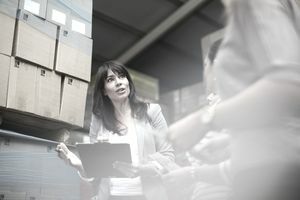 An optimized supply chain is “getting your customer what they want, when they want it — and spending the least amount of money possible accomplishing that.” Optimizing your supply chain is what we endeavor to do (as supply chain professionals) and to do that, we have to touch many other functions within the company. To understand supply chain and its impact on you, the non-supply chain professional, let’s start at the rump (as they would say in the world of toilet paper). Customer Fulfillment: Who is your customer? Simple question, yes? Your sales team might tell you that your customers are the distributors or retailers that you sell your goods to. Your marketing, product development, and customer service teams might tell you that your customers are the consumers who use your goods (i.e. they buy from your distributors or those retailers). The point is — there are nuances to every aspect of a business. And the same is true in supply chain. Customer fulfillment is marginally different than customer service, which may or may not be the same thing as an inside sales force. In some companies, customer fulfillment isn’t a part of supply chain — but in many small to medium-sized companies, it is. So how does this aspect of supply chain impact the non-supply chain manager? If you’re in Sales, on-time customer delivery can mean the difference between making a sales goal or not. If you’re in Finance, you’re tracking revenue, too. But you’re also tracking cost. Did your supply chain team meet its on-time delivery goal, but by picking up the tab on overnight expedite fees? Or by carrying more inventory than you budgeted? The last part of supply chain optimization — “spending the least amount of money possible accomplishing that” — is what keeps CFO’s awake at night. Inventory/Logistics: How much inventory is in your supply chain? Where is it? On the high seas? At a 3PL? And why is that important? If you’re in Finance, it’s because you paid for that inventory. And you’re continuing to pay for it with insurance, warehousing and other inventory carrying costs. If you’re in Quality, you inspected all that inventory (or are going to) or need to understand the priorities, so you know which of it to inspect first. If you’re in Accounting, you’ve got a list that tells you what inventory is on your company books. Would your supply chain team agree with your list? When was the last time you cycle counted or conducted a physical inventory? If you’re in Sales, is what you’re planning to sell next month already in inventory or inbound? Production Planning/Manufacturing: Supply chain brings your raw materials and components in-house. And it plans the production of your finished product. If you’re in Engineering, is production planning in-line with the specifications and processes you’ve created? If you’re Manufacturing, is production planning in line with your capacity? Are the necessary raw materials available? If you’re Quality, do you know what’s coming off the line to inspect? If you’re Sales, is production planning aligned with your sales plan? If you’re Accounting, is all that WIP part of your COGS planning next month? Sourcing/Purchasing: Supply chain can source your products from the most qualified or the lowest cost suppliers. They process the purchase orders and bring the product in-house. If you’re R&D and Product Development, are those the suppliers you wanted when you developed your new whiz-bang product? If you’re Marketing, are your product launches aligned with what supply chain is purchasing (especially long lead-time and holiday products)? If you’re Finance, does supply chain know what your COGS targets are? Are they selecting suppliers with those targets in mind? We supply chain folks are simple people. We only want to get our customers what they want, when they want it — and do that by spending as little money as possible. If you — non-supply chain manager — can help us do that by communicating with us early in your financial, sales, marketing, product development, and manufacturing resource planning — that’d be great. If you’re nice to us, we’ll let you know about our wins (COGS reductions, inventory accuracy, supplier expedites, etc.). If — once in a blue moon — you drop a “kudos to supply chain” in a staff meeting, we might even optimize a little harder for you (and the company). Again, we’re simple folk, with simple pleasures. On-time delivery. 100% inventory accuracy. COGS reduction. Supply chain is happening all around you. If you don’t think your job is impacted by it, think again.